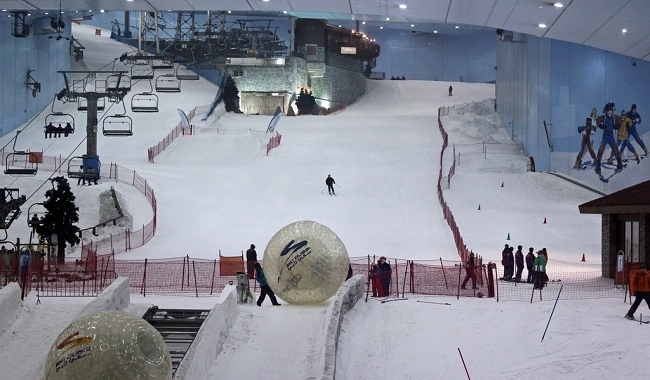 Ski Dubai is an indoor ski resort, first in the Middle East, with 22,500 square meters of indoor ski area. 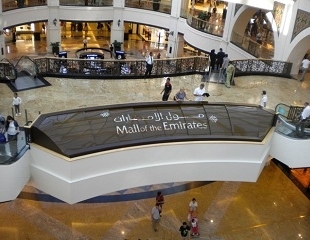 It is a part of the Mall of the Emirates, one of the largest shopping malls in the world. Ski Dubai has 5 runs that vary in difficulty, height and gradient where skiers and snowboarders of all skill levels will enjoy various slopes and snowboarders can also practice their stunts in the Freestyle Zone. Ski Dubai is intended for skiers and snowboarders, but also for all those who just want to experience snow. 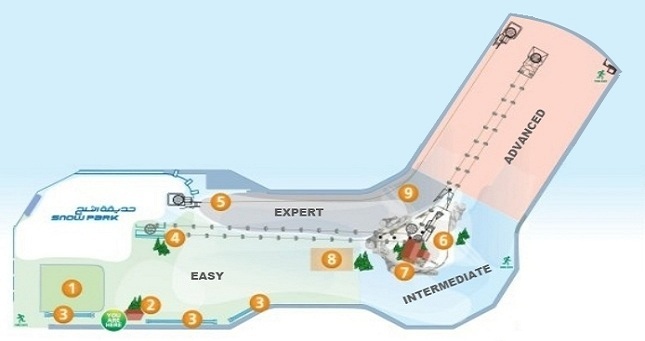 There are five runs (the longest being 400m) and a Freestyle Zone with jumps and rails. Those who have never skied/snowboarded before, will need to take lessons, which are also provided, and those not interested in learning can enjoy the snow or see the penguins in the Snow Park. Almost everything you will	need of equipment is provided with the slope pass (jacket, trousers, skis, ski boots, snowboard, snowboard Boots, ski poles, disposable socks, helmets for children), except gloves and hats (for hygiene reasons). However, if you don't have your own on you, you can buy them in the adjoining ski shop (gloves start at around Dh10, hats at Dh30). If you bring your own equipment and/or clothing you�ll get a 5% discount on each. Also, you will need a locker - rental is Dh20 and can be used by several persons. Weekends are more crowded, but there is a faster-moving secondary lift, a rope tow, that significantly shortens the ride uphill, giving you more runs per hour than you can get riding the chair. Ski Dubai is directly accessed from the Mall of the Emirates, one of the largest shopping malls in the world, featuring 520 international brands, a 14-screen multiplex cinema and the largest Carrefour in the city. The Mall interior is pretty spectacular, so once there, take some time to browse through numerous shops and cafes. For those who want to stay overnight, there is a five star Kempinski Hotel and The Pullman Dubai Hotel. 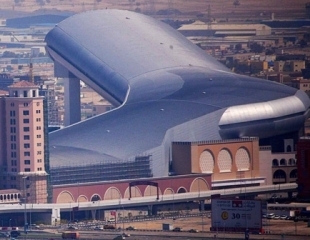 The 85-meter-high (280 ft) indoor mountain looks astonishing from the outside. Inside the L shaped steel structure, snow covers an area the size of three football fields. The United Arab Emirates is one of the hottest countries on the globe, so an extremely efficient insulation system helps the facility maintain a temperature of -1 �C during the day and -6 �C at night when the snow is produced. For those who are not interested in skiing, but still want to experience snow, Ski Dubai houses the worlds largest Snow Park. It includes Twin Track Bobsled runs, a Snow Cavern filled with interactive experiences,	Giant Ball runs, and Tobogganing Hills. For a view of the Ski Dubai main slope visit the observation tower or jump on the chairlift. Penguin show starts every day at 2:00 pm, 4:00 pm, 6:00 pm and 8:00 pm and is included in the price. 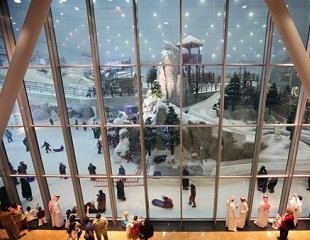 For a quick glimpse at Ski Dubai without freezing inside, check out the large window in the Mall of the Emirates. This is enough to get an impression and it is absolutely free. For anything more you will have to get inside and pay the ticket. You can also have a drink with the view in one of the cafes near the window. 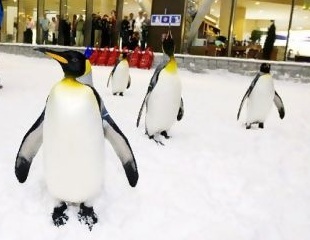 For real penguin-lovers, who want more than just see the penguins marching through the Snow Park, there are a few packages that include meeting the penguins and viewing them play under water. Check the details and prices on Ski Dubai Official Site.